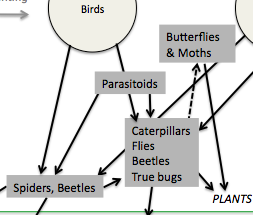 This entry was posted in Deliverables and tagged Chris Buddle, collaboration, Food webs. Bookmark the permalink. Glad to see this work, I wish I was aware of it earlier! Our group has been working on arthropod food webs at the margins of lakes and land in northeastern Iceland. Much of our work has been centered on what role emergent aquatic insects (midges) have on terrestrial ecosystems. We propose that what goes on in the water has huge effects on the surrounding land.